Anxiety is a very common and very unpleasant feeling we all get from time to time. We are surrounded by a stressful environment involving traffic jams, deadlines of work and other duties that worry us and trouble our minds. Anxiety may stimulate us and help us solve problems better. But if it becomes overwhelming and keeps us from concentrating, then anxiety does no good, but prevents us from facing and solving our troubles. 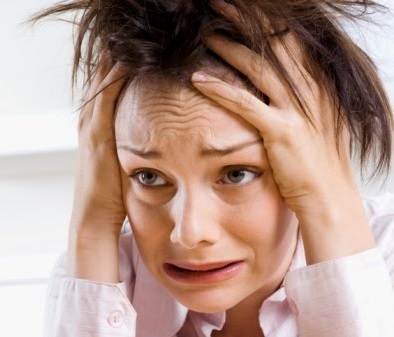 For better life, we provide you some suggestions on how to overcome anxiety. Usually, anxiety is a mild, unpleasant thing, which means the "fight-or-flight" is kicked in. When anxious, you may experience racing heartbeat, tight throat, rapid breathing, dry mouth, trembling knees, hands and voice and even nausea. Knowing how to overcome anxiety can come in very handy indeed. How to overcome anxiety? The first step is to find out the trigger. Anxiety generally manifests itself as some sort of panic attack that disenables you to react and in certain situations even leads to an absolute impossibility to do anything at all. Anxiety is caused, in most cases, by the strengthening of an internal fear of ours. The moment you get to know what that fear is, you will find strength to face it courageously and solve it effectively. Once you have come to know where your anxiety comes from, you should think about whether you believe it to be solvable at the moment or if it is intangible fantasy. If your anxiety belongs more to your imagination than to reality, you should try to leave it aside, and maybe cope with it when it is more realistic. If it’s more of a real thing, you should tackle the problem as soon as you can. A large number of clinical cases believed to be caused by anxiety come with breathing problems. To fight this, try to slow down your breathing as much as you can, breathe in as much air as you can, then hold the air as long as you can and try to blow out more air than you have taken in. This will balance the carbon dioxide levels of your body and calm you down. Meditating and praying have proven to be very efficient in combatting anxiety symptoms. Meditating and praying, on the other hand, allows you to separate your thoughts from your anxiety source, enabling you to find positive streams of thought. Although this idea might sound a little movie-like or simple crazy, trust me, it does help, a lot. One of the best ways for you to get rid of your anxiety is simply to yell out loud to get all the negativity out. Just yelling, screaming, insulting even, as loud as you can. You should try of course to find a private, isolated place to do this. Otherwise, something like a punching bag or a set of drums might do as well. It's the talking cure or so it has been called. Isn't it the way most psychologists treat their patients? In order to help the anxious person, you should invite them to lie down on a couch comfortably and then let them talk about all of their problems so as to exteriorize them. It’s the same method Freud used over 100 years ago. Talking things out has some sort of magical effect on how we feel. It really helps. Just speak it out. How to overcome anxiety? Just face it. The most admirable people are those that face misfortune no matter what, even if their situation does not seem to change. Anxiety can be some sort of inner voice reminding us of our troubles, the risks of life and our past failures. Look at yourself in the mirror when you need to and remind yourself of all the good you’ve done, how strong you actually are and encourage yourself with positive thoughts! So you can face all the negative emotions and kick them away. It might seem contradictory, but sometimes avoiding thinking about what the worst that could really happen just makes things worse. After all, if you’re reading this, it means you are still alive and your brain must be functioning well. When you are anxious, just think and image the worst result. Then you may find there is nothing so horrible that you can't put up with. To be frank, the reality never gets as bad as you think it will be. Exercising is a very human and natural thing. It does not have to imply tremendous efforts either. In fact, enjoying a nice long walk in a park or field might be the best exercise you could do to fight anxiety. Exercise is not only a good way to release your stress, but also releases endorphins that make us feel happy. In this sense, anxiety can be seen as our body telling us: "Hey, come on, give me some of that exercise I love". Some people seem to consider a visit to a psychologist as a drastic measure, next to total desolation, while it shouldn’t be seen that way. If you can’t get out of your anxiety, instead of dwelling deeper and deeper into that thought and aggravating your situation, you should consider visiting a professional, there is no shame in it. It's just like that when you have a stomachache, you go to see the doctor.